James Forrest has signed a new deal with Celtic, tying him to the club until the summer of 2019. The Scotland winger, 25, was due to be out of contract midway through the season. 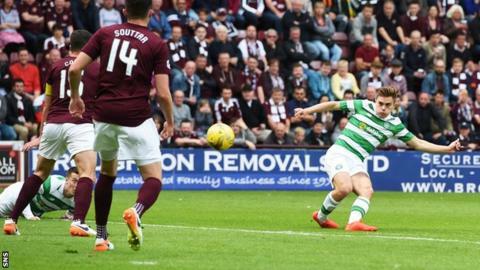 He scored Celtic's opener in Sunday's 2-1 Scottish Premiership win over Hearts - the champions' first league match of the season. "I've been here since I was nine," he told Celtic's website. "I'm just delighted to sign here again." Forrest made his first-team debut in 2010 and has made more than 180 appearances for the club, scoring 31 goals. The first of his 13 Scotland caps came in 2011. He follows Australian midfielder Tom Rogic in committing himself to Celtic until 2019. Second-half goals by Uche Ikpeazu, John Souttar and Sean Clare put Hearts into the Scottish Cup final at the expense of Inverness Caledonian Thistle.